Two hundred and seventy-four readers love this post. DrinkWire is Liquor.com’s showcase for the best articles, recipes and reviews from the web’s top writers and bloggers. 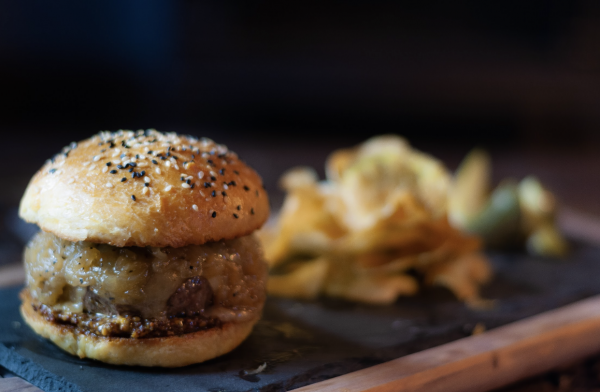 In this post, Amanda Woods offers a boozy burger recipe. Step 2. In a cast iron pan over medium heat, place each burger in pan and cook for 3-4 minutes per side. (directions for medium burgers). After first flip, place cheese on top of the burgers to melt while cooking. Step 3. remove the cooked burgers from the pan and set aside to rest. Wipe out the pan and return to the heat. Step 4. Butter the buns and toast in the pan. Step 1. Place 1 tbsp. of the mustard on the bottom bun followed by the burger and top it off with 2 tbsp. caramelized onions. Step 1. Place onions and water in a sauce pot and boil until water is 90% evaporated. Step 2. Reduce heat to low and add the canola oil and salt. Cook stirring occasionally for about 30 minutes or until the onions start to get lightly brown. Step 3. Add the whisky and butter and cook until the whisky cooks down and sugar melts. About 10 minutes. Step 4. Shut off and remove from the heat. Add the butter and stir to combine. Step 1. Combine all ingredients in a car with tight fitting lid and leave on counter at room temp from 3-4 days. Step 2. After seeds have softened, place mustard in blender and puree until desired consistency. *to cook of the alcohol, place the gin in a sauce pot over medium low heat. Once small bubbles start to form around the edge of the pan, remove from the heat and light the gin on fire using a long match or stick lighter. return to the burner and slowly swirl the pan until the flames go out. Once flames are out, remove from the heat and add to the mustard mixture. We are a father and son team (David & David II Woods) who share a dream and a passion. Our love and appreciation for quality spirits sparked the dream of bringing small batch spirits to our community. It all started during a family dinner with a joking statement of “lets make our own whisky.” With father and son both having the fascination to see how things are made, a half-hearted joke turned a bit serious over the years. We explored the idea by researching, studying, and some say obsessed over how to build a still and process alcohol. Soon enough the saying “From hobby, to obsession, to profession” was coined and Wiggly Bridge Distillery, with some effort, was created. We won’t settle for anything less than the highest quality spirit and now have added food utilizing our spirits with the help of our talented chef, Shane Hetherington. The distillery has been started by family and the future lies with upcoming generations. Our employees are like family and look forward to growing together. Wiggly Bridge Distillery was started with the belief that being small is an advantage. By utilizing long forgotten styles and techniques such as hand building our own copper pot stills, every dent and angle uniquely contributes to the flavor of our spirits unlike many mass produced spirits on the market now. Starting from an idea to now winning awards, we realize they have created something truly special. We have brought Cheers!